Last week I was ordered into the local financial institution over on Usury Street to make some emergency fiduciary repairs on my despicably low-level account. The guard at the door, alert to my status as a bottom feeder in the banking food chain, twice gave me the once-over before permitting me access to the line which snaked around two corners before even entering the Fiscal Lobby. The other people in the line never made eye contact with me. They just stood there, absorbed in their own investment worlds, exuding affluence and solvency. One smartly dressed junior tycoon actually leaked bits of venture capital onto the lavishly waxed carpet, and didn't even bother to gather it back up. When the line inched forward, it was accompanied by the rustle of paper shekels and mazuma, a sound that inspired vaguely larcenous thoughts in me. For, I reasoned, a fraction of the pelf evaporating into the gilded recesses of this savings and laundry could resolve the grubstake dilemmas of me and scores of other lucre-challenged denizens of the music industry for the foreseeable future. A day passed before I reached the foyer where stern money waitresses stood reproachfully behind barred windows. From past experience, I knew they were keen to hold onto any legal tender, and downright zealous when it came to charging account penalties. I had briefly sunk into a pleasant plutocratic reverie in which I was a party line parvenu, when the repeated screeching of "Next!" brought me back to beanless reality. I approached the counter and was glared at by the Old Lady of Threadneedle Street herself. Incurious, aloof, judgmental, she seemed the perfect foil to my bid for a reasonable financial settlement. I was a blue plume of squalid egret smoke in her posh Beverly Hills perfumery, a karaoke credit risk in her Colonial Williamsburg Golconda. Her full sneer, however, strengthened my resolve, and I proceeded with the business at hand. 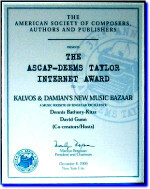 Why is it that the music community -- especially the dissolute inhabitants of the netherworld that is contemporary music and, by extension, the producers and assigns of Kalvos & Damian's New Music Bazaar -- is held in such low esteem by the overtly pecunious? Are we such poor risks in annuity plans and sinking fund conspiracies that we must forever be pariahs to prosperity? Do modern music mongers need advanced degrees in accounting and finance before we can get a bank teller to deposit a third party certified check? Are we good for no more than barely concealed derision as we mail in late charges on our recording loans each month? Why do automatic teller machines limit my withdrawals to a dollar a day, and then charge 18% interest on the amount I wanted to take out? What is the difference between an IRA and an Irish militiaman's milk money? Why does the monthly dormancy fee on a flambeau oriange account seem to fluctuate with the bank manager's blood pressure? Don't look for these or any other fiduciary answers on this 195th episode of the Bazaar, because we're in hock up to our hind legs directly above our feet, and can barely squeegee enough of a cash flow to keep the Contemporary Top 40 wolves away from the door of me and of course Kalvos.